The country mansion outside Moscow, Russia, in which Lenin lived out the final phase of his life before his death in 1924. You can see not only where he lived, dined, worked and slept, but also his death bed, death mask, and the tub in which his body was first embalmed. In addition there is a very retro late-Soviet-era museum about Lenin nearby that is still full of unbridled cult of personality. More background info: The manor house at this estate in Gorky (or “Gorki” – both spellings seem to coexist; and Leninskye is sometimes spelled “Leninskie”) dates back to the early 19th century and was developed by a war hero from the Napoleonic Wars, but was then owned by a range of important figures from Moscow. In 1909 it was taken over by the widow of a textile magnate. She got remarried, to another important person (some sources say a later Moscow mayor, others say head of the police). She hired some top-notch architects of the time to have the estate reworked and expanded in a then fashionable neoclassical style (the columns on the outside façade date from this remodelling, for instance). After the Russian Revolution, the whole complex was “nationalized”, i.e. appropriated by the Bolsheviks. Lenin recuperated here after the assassination attempt on him in August 1918. 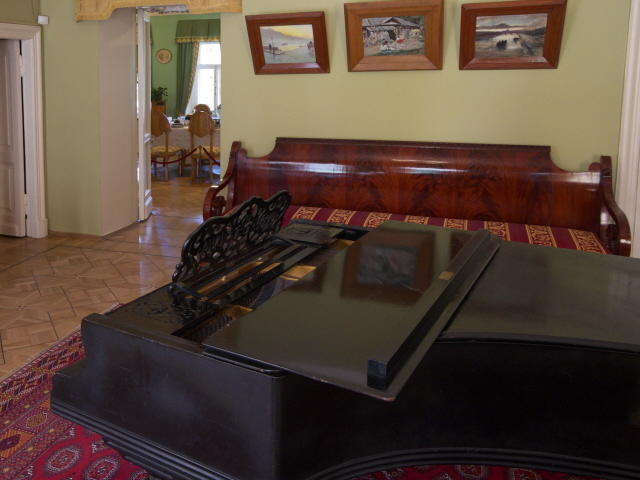 After that he continued to use it as a dacha (weekend country retreat). When Lenin's health declined from 1921 he returned more frequently to this place and was cared for by his wife and a whole host of doctors treated him, though to little avail. Then in May 1922 he suffered his first stroke, which caused temporary aphasia, but by October he had recovered enough to return to Moscow. Yet in December he had a second stroke and again had to return to Gorky, and never left again. In March 1923 he suffered a third stroke, more massive than the previous ones, again losing his speech and becoming partially paralysed. His recovery was slow but coming along, but on 21 January 1924 Lenin fell into a coma and died, just a few months before what would have been his 54th birthday. The official cause of death was given as cerebral haemorrhage, though there remain doubts and some alternative mystery theories have been proposed (including the one that Lenin may have had syphilis or even one that he had been poisoned). Anyway, after his death his corpse was provisionally embalmed in a bath tub at the mansion in Gorky, and then transported to Moscow where the body lay in state for three days while as many as a million people came to see him and pay their last respects. On the funeral day he was transferred in a grand ceremony to Red Square and placed in a vault. Against Lenin's own wishes and despite the protests of his widow, the Politburo was adamant that the body should be professionally embalmed to preserve it and then be put on permanent display in a specially erected mausoleum on Red Square. The estate where he had died, now named Gorky Leninskiye in his honour, first became a museum in 1949. A whole new additional museum about Lenin was added a short distance away as late as 1987, in a very Soviet but modern constructivist style. 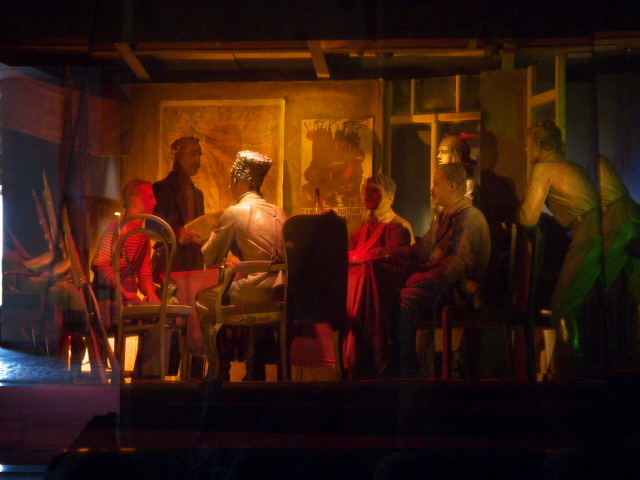 It was the last such museum to be set up in the USSR before its collapse in the early 1990s. Its contents in particular are a veritable time capsule (see below). The mansions where Lenin lived and died have recently been refurbished and are resplendent again in fresh clean coats of paint. Moreover several outdoor displays have been added (see below). What there is to see: When I went to see Gorky Leninskiye in August 2017 it was as a guided day excursion from Moscow with Oleg Alexandov of Three Whales. It was quite an investment of money, but I really wanted to do at least one tour with him as I had read such raving reviews of his services that I wanted to see for myself (he was also the guide for Chuck Thompson, author of The 24 Essential WWII Sites – European Theater, who also heaped praise on Three Whales and Oleg). In short: he did not disappoint, on the contrary. Even as we started the drive through central Moscow he was a treasure trove of information and insights into Russian history and life. The ca. one hour drive to Gorky Leninskiye thus never got boring. It's also worth pointing out that Oleg's command of English is way above the usual average in Russia and that's quite some asset (and he convincingly puts on an accent that almost, but just not quite, sounds like British RP, which I found very endearing – whereas some sort of faux American pronunciation, mixed to varying degrees with the classic Russian accent, is more commonly encountered in guides these days …). Moreover, he has a pleasant and extremely competent manner and unbounded enthusiasm for his topics. But now for Gorky Leninskiye itself. We arrived at the newer museum where there is a car park (paid parking for those arriving independently). Oleg went inside to arrange our tickets for the day and then we were on our way. 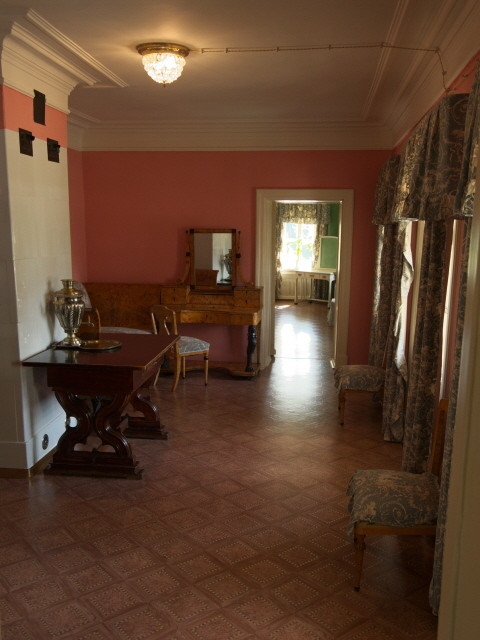 It turned out that the actual mansion of Gorky Leninskiye is quite a distance from the museum/car park. But it was a fairly pleasant stroll through the park – and along the way there was a substantial extra open-air exhibition of old Soviet propaganda posters, especially from WWII (many featuring Hitler in mocking and depreciating cartoon drawings). So that was an unexpected add-on. Whether these posters are on permanent display or were there only temporarily, I don't know. What I didn't see at all was the collection of Lenin statues/busts I had seen photos of online. Maybe they were in a different part of the park where we didn't pass through. Finally we got to the old mansion at the heart of the park. Here we were allocated a local guide. She spoke Russian but Oleg delivered a competent relay interpreting service for us. In fact, it seemed that occasionally he overshot the mark a bit, saying more than had been said in the original, thus embellishing and adding to it information he had clearly totally internalized. The local guide only complained at one point when he must have gone a bit too off-road and/or she objected to the content of whatever he had added. But it was a generally friendly atmosphere (though not without the certain sternness you often get with female Russian guides – that just comes with the territory all over the former USSR). The tour started in the smaller north wing, which was where Lenin apparently lived initially before moving into the Big House in the centre of the complex. I won't try to recreate the whole narrative here, but instead just pick out a few highlights of what was there to be seen. You obviously get to see lots of antique furnishings, but also, for instance Lenin's telephone, through which he retained a direct line to the Kremlin when he was out here recuperating. 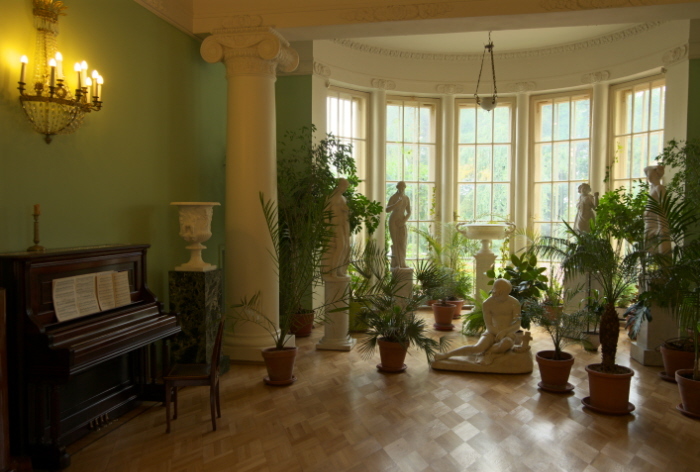 While the north wing was comparatively modest, the bigger main mansion in the centre of the complex turned out to be shamelessly luxurious, especially in the grand salons on the ground floor with the big dining room, a piano lounge and a winter-garden-like salon with huge bay windows. Heading upstairs the guide pointed out the extra banisters that had been attached to the staircase's railing. Apparently these were specifically installed to help the semi-paralysed Lenin still negotiate these stairs following his third stroke (see above). 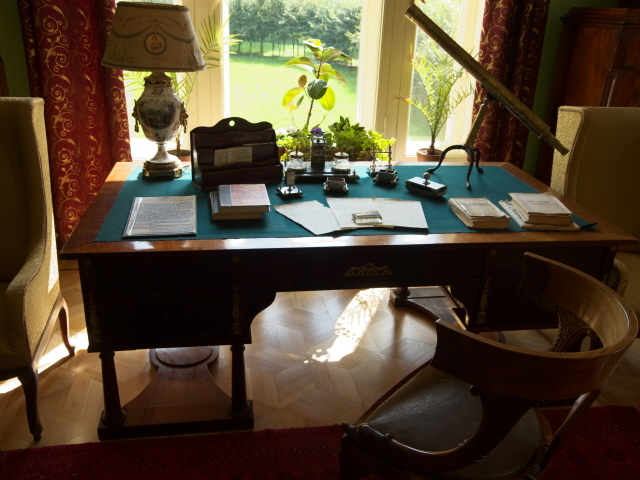 On the first floor we eventually saw not only Lenin's study, but also his bedroom – with his death bed. 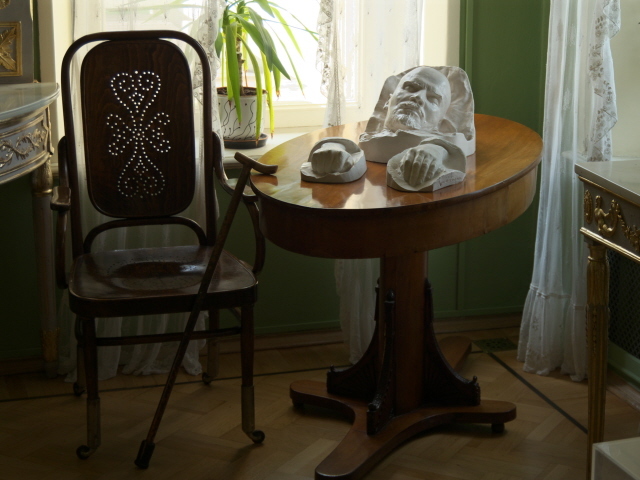 On a small table in the opposite corner one of Lenin's death masks can be seen (or maybe it's a copy – see Gyumri) together with what looked like plaster casts of his hands. His walking stick leans evocatively by the table and the empty chair next to it. 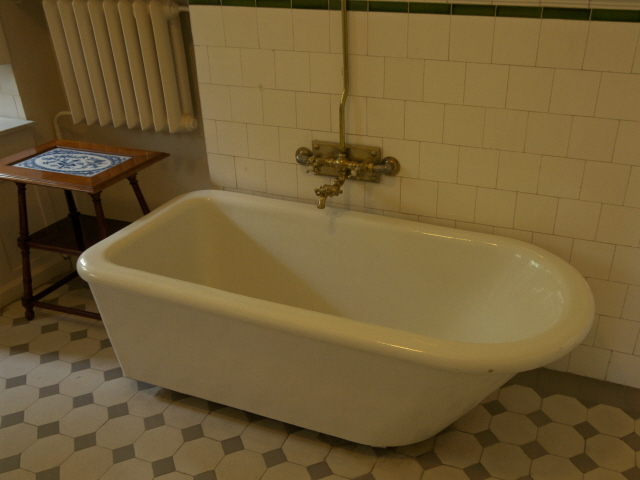 Perhaps even darker in atmosphere than the death bed is the bathroom with the bath tub in which Lenin was allegedly first embalmed … not yet for posterity but only for the transport and funeral – the permanent embalming for the mausoleum came a bit later in Moscow. Back outside we proceeded to the garage building – passing a series of glass bull's eyes set into the ground. These, so we were enlightened, are actually skylights for an underground passage leading to the estate's kitchen, so servants could take dishes over to the dining room without having to step outside. 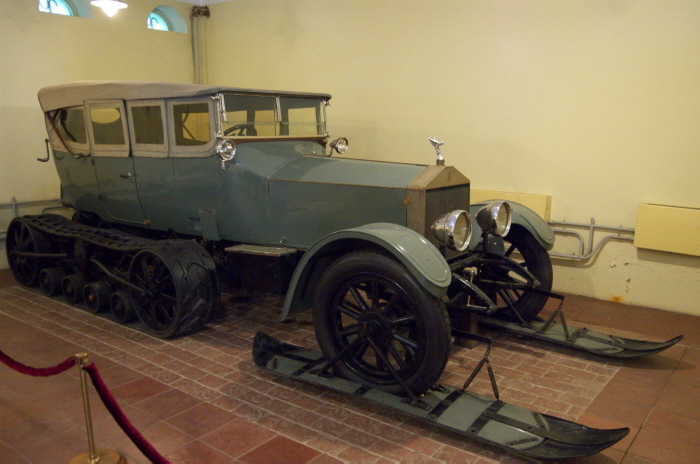 The highlight inside the garage is definitely Lenin's perfectly preserved Rolls-Royce “Silver Ghost”, purchased by the government in 1922 and specially adapted for the Russian winter by converting the rear wheels into caterpillars and placing the front wheels on skis. It is said to be the only half-track Rolls in the world! Also interesting in the garage is a semi-electric wheelchair that was also specially constructed for Lenin when he lost his mobility due to his ailments. After all this we parted from the local guide and slowly walked back through the park towards the separate Lenin Museum by the car park. Here a different guide took us around. If the Gorky Leninskiye mansion felt heavy with authentic history and tragedy, this museum was a veritable time machine back to the late Soviet era and its Lenin cult of personality! The constructivist building itself with its cubistic marble-clad columns is already typically Soviet, and not in a bad way, but the interior was jaw-droppingly antagonistic and just weird. We ascended some wide shallow stairs covered with a red carpet to get to the central hall of glorification (my expression). 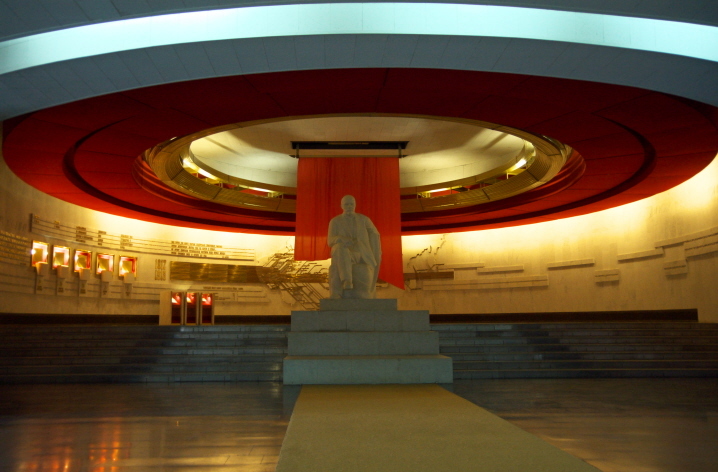 In the middle of this a sitting marble Lenin statue greeting visitors in front of a red flag and “crowned” by a halo-like circular ceiling structure that had a futuristic, somewhat Starship-Enterprise-like appeal to it. Apparently this hall is dedicated to the October Revolution and some significant documents/decrees associated with it are mounted on the wall behind Lenin or framed in glass. To my surprise the guide even allowed me hold the original remote control with which she started these “shows”, even though it must be quite a valuable and probably irreplaceable antique piece of technology from the 1980s. 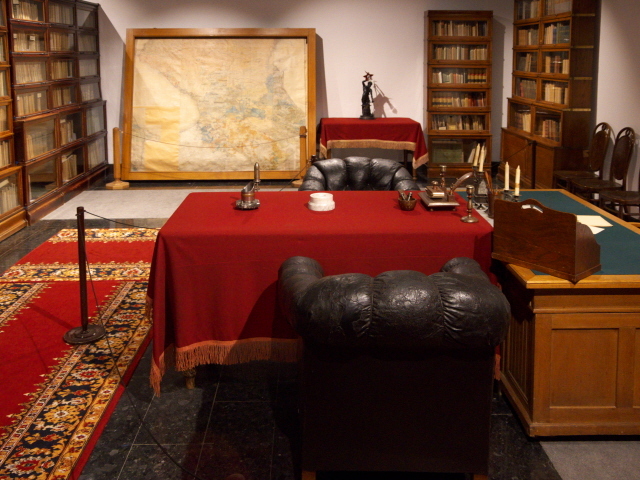 The final section of the museum was the recreation of Lenin's office at the Kremlin, relocated here from the actual rooms in the Kremlin at some point, I think in the early post-Soviet era. 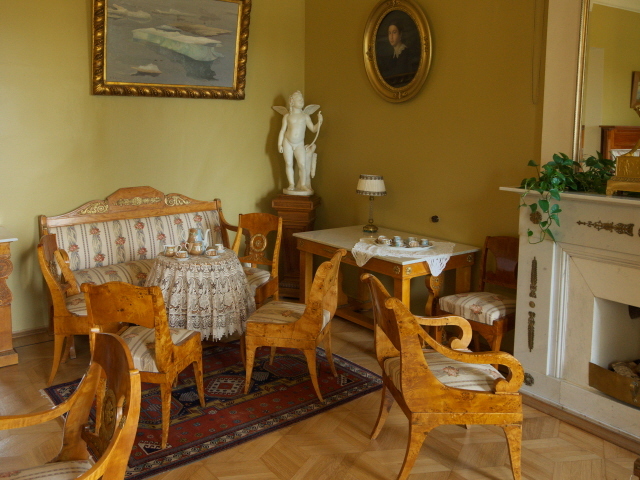 It consists of typical heavy wooden desks, leather armchairs and sofas, and rows of bookcases. There are pictures from the Kremlin to indicate where it would have been and also some images from the inside, including of a big meeting table with wooden chairs (the Politburo meeting room perhaps?). The original chair Lenin would have sat on is on display at the museum too – roped off, so that visitors can't be tempted to sit in the great man's space. That was it, and we took leave to head back to the van for the return drive to Moscow. The way back was less talkative – probably because I was just silently recalling all I had seen in the previous few hours and contemplating the history and also the bizarreness of some of it for myself. All in all: this is clearly not worth it for anybody. You have to come with a good dose of genuine interest in the historic phases involved. Obviously for old communists and those still committed to the cult of personality about Lenin this is a must-visit place. But for everybody else it may be a little much and not really interesting enough. Add to that the considerable investment it takes to get there in the form of a fully guided private excursion from Moscow. So think hard as to whether this is the thing for you. I, for my part, do not regret in the slightest having made it out here and having hired the guide I had (despite the painful costs). In some ways it was one of the highlights of my Russia trip of 2017. I am aware, though, that I may well not be representative in this view and that many others would find Gorky Leninskiye boring and a waste of time and money. But I loved it. Location: some 20 miles (30 km) south from central Moscow, beyond its outermost Ring Road. Note that there are actually two locations, the estate as such and the newer museum, which are a bit under a kilometre (3000 feet) apart but connected by foot paths. Access and costs: tricky independently, but cheap; very easy by guided tour from Moscow, but quite expensive. Details: This is a place that is not on most foreign tourists' radar, and it is far out of Moscow, so getting there independently is tricky by public transport, though it's not impossible, provided your Russian is up to the task. If it is, then you could get the metro line 2 (dark green) to Domodedovskaya, get out at the exit furthest from the city and look for a bus or marshrutka stop (I read somewhere it's No 439, which runs about half-hourly, and the ride takes something like 30-40 minutes). Get out at "Eksperimentalnaya baza" (tell the driver in advance), and walk from there, first north, then turn left until you see the constructivist museum building (see photos for reference) and arrange your tour there. With a local guide only Russian-language tours are available. And tours are compulsory. You cannot just walk around on your own inside any of the buildings! Alternatively, you can get an elektrichka suburban train from Paveletsky station in Moscow to (Platforma) Leninskaya (ca. 40-60 mins, frequent), but from here it's a long 2 miles (3 km) walk, first along a path through a field heading east and through an underpass under the motorway (yuk!). Then walk all the way past the northern edge of the village of Yam, turn left and use the bridge to cross the river, and take the next right for the approach road to the estate. There may be checkpoints, so you'd have to explain your mission. Whether you can arrange a locally guided tour at the estate itself or if they'd send you to the museum first, I cannot say. You'd have to try your luck. Anyway, all this would take an awful lot of time and is full of real and potential complications. If those options sound too daunting or if you require an English-language guide, then you'll have to bite the bullet and pay for a guided tour from Moscow. As I said it's not cheap at all, far from it, but you get what you pay for. There are a couple of operators offering this as a day excursion from Moscow. I used Oleg Alexandrov's “Three Whales” company, as I had read so many good things about him (see above). You have to enquire and arrange everything direct (oalexandrov(at)mtu-net.ru) and it's advisable to do so well in advance to ensure availability (Oleg is rightly a popular guide). The price he charged me and my wife for the whole excursion was 340 USD (also payable in cash in unblemished US banknotes). This included transfer from our hotel in Moscow and back by mini van, all fees and English relay translations during the guided tours at the mansion and the museum. Obviously a tour for just one individual would cost relatively more, while the price drops if you manage to get a small group together. This also applies to other operators. You may think 340 USD for two is excessive, but I've seen other operators charge even more, and whether they can match (let alone beat) Oleg's professionalism and quality I cannot say, but I'd be surprised, let's say. If you do want to try to do it independently, take note of the following opening times: 10 a.m. to 5 p.m. (some sources say from 9:30 a.m., and some parts of the complex may close an hour earlier); closed Monday and Tuesday, so aim for Wednesday to Sunday. Admission: there seem to be various packages, depending on how many of the separate buildings you want to include, ranging from 50 to 600 RUB. A bargain, compared to the tours from Moscow, but only available in Russian. Time required: The best part of a day, at least 5 hours (that was the length of my tour), probably quite a bit more if doing it independently. Combinations with non-dark destinations: see under Moscow.